If you’re searching for a cozy cottage that is situated just steps from the shoreline of the Atlantic Ocean, you’ve found it at Off the Hook! This three-bedroom vacation rental home in Kitty Hawk was recently renovated to provide your family with beautiful fixtures and furnishings, as well as top-notch decor so you are sure to feel right at home during your stay on the Outer Banks. Located on a quiet side street that is perfect for walking or biking, Off the Hook is only one block back from the beach. In addition to offering partial ocean views, this ocean side residence is also just around the corner from the Atlantic Ocean. You’ll find a public beach access just a quarter-mile away at the eastern end of Balchen Street. The beaches of Kitty Hawk were recently widened during the 2017 beach nourishment project, so you’ll find a wide expanse of shoreline with plenty of room to spread out and enjoy a day of fun in the sun away from all the other beach goers. Grab your beach towels, umbrella and favorite beach read, and take a short five-minute stroll to the shoreline to spend the day riding the waves and soaking up an abundance of sunshine. Off the Hook is conveniently located right in the center of Kitty Hawk between the Highways - so you'll enjoy easy access to all the action! An assortment of popular Outer Banks restaurants are just a few minutes away from this ocean side vacation rental home. Bad Bean Baja Grill, Barefoot Bernie’s Tropical Grill & Bar, Hurricane Mo’s Beachside Bar & Grill, and Black Pelican Oceanfront Restaurant are all excellent choices within one mile from Off the Hook. And if you’re looking for hotspots that offer great food, amazing views and live music, venture a little further to the north to dine at local favorites such as Rundown Cafe—which features a spacious ocean view hula bar—and Art’s Place, home to the best burgers on the entire beach. Book Your Beach Escape Today! If a recently remodeled vacation rental home offering partial ocean views and easy access to the beach just a few steps down the street is what you seek, look no further than Off the Hook! 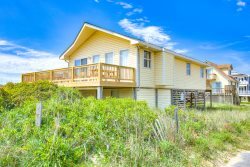 This gorgeous Kitty Hawk vacation rental home has everything you need to make your next escape to the barrier islands your best trip yet! Secure your stay today! Kitty Hawk is rich in history and tradition. It is made up of a traditional village, a beach community of residential cottages and hotels, and a 461-acre maritime forest reserve called Kitty Hawk Woods.